Lindsey and Stephen make quite the beautiful case for a Venice elopement in these images captured by Allison Harp Photography. The couple decided on a trip across the world to celebrate their love, and they giggled, held hands, and embraced through the entire experience. Wanting to have some piece of their family there on the day, Lindsey wore her late grandmother’s fur cape over her Allure Bridals ballgown and tucked a photo of her Papa into her bouquet. The newlyweds were the talk of the streets as they exited Scuola Grande Dei Carmini, receiving congratulations in several languages from delighted strangers passing by. According to Stephen, every part of the day was memorable. We got to soak in the little moments that would often get swept up in the chaos of the day. Stephen struggled with tying his first bow tie, our first look was surrounded by people, and as we exited the church and walked through the streets of Venice we received countless congratulations in every language and applause around every corner. It seemed like the entire city was happy to see us so in love! We wanted something timeless, memorable, and most of all effortless. In keeping with the theme of Venice, romance was key. His blue tuxedo really popped against the Venetian streets, and my dress fit seamlessly with the setting and temperature. For us, the key to our ceremony was not losing sight of the day or the marriage itself. 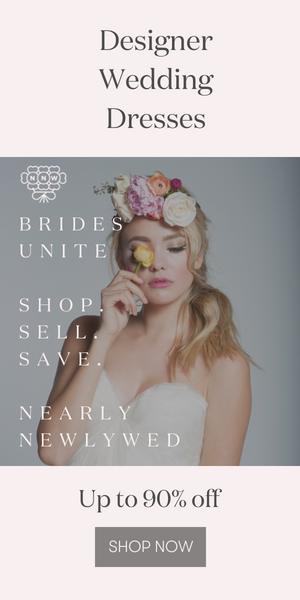 We live in an era where each bride has a different vision for their wedding day and some cost more than a house. With so many different opinions from family members, locations to choose from, and guest lists things can quickly get out of hand. We decided early on that we would elope and Venice seemed like a perfect location to do so! We wrote our own vows. They were sweet, heartfelt, and things we would have likely never said in a wedding with guests. Therefore, they were all the more personal and memorable. We giggled uncontrollably and held hands as we read them, and wore our hearts on our sleeve. Let me tell you about Allison Harp. This girl should be given an award or a Nobel Peace Prize, I swear. She is such a trooper. She flew overnight from The States, arrived in Venice the morning of our wedding, and came straight to us fresh off a LONG international flight. She met us at the hotel for coffee and I remember getting the biggest hug from her when she arrived. It made me feel so at home and like I had a great friend with me. She shot from the minute we started getting ready at 10 AM to literally sunset. She went so above and beyond with every single detail from helping carry things like my bouquet, extra shoes, my coat, etc. while carrying two cameras and walking through Venice. I cannot possibly thank her enough. Having Allison with us felt like we were so at home and she made us so insanely comfortable. She kept us laughing and really just MADE the experience what it was. We cannot wait to work with her more for literally every single thing we can. I wore my grandmother’s monogrammed fur cape over my dress and attached a photo of my deceased grandfather to my bouquet. This way, my Papa was able to walk me down the “aisle” of sorts and my two favorite people were able to be a part of our ceremony even though they weren’t physically present. I was inspired by Grace Kelly for sure. I was vehemently opposed to a ballgown originally due to our overseas wedding and travel difficulties, but in the end this won out (I vacuum sealed it and folded it into quarters and put it in a rolled carry on — thank god I did, because the airlines lost our luggage for the first 5 days we were in Rome and Florence. They found it two days before our ceremony and Stephen‘s tux finally arrived just in time for Venice!!). Tulle is great for traveling surprisingly because when you hang the dress up, all of the wrinkles just fall out! The gown’s elegance, grace, and glamour swayed me and I couldn’t help but feel like I was wearing the most romantic and timeless dress in the world as I twirled through the canals of Venice. Complimenti to Lindsey and Stephen on their Venice elopement! Not ready to peel your eyes away from all this beauty? Click on over to see a stunning Pronovias gown in the streets of Venice. You’ve captured some awesome shots of a lovely couple. Such a classy set of photographs. These wedding photos have it all. Stunning location and great looking couple. such a great color tone to them also. Beautiful wedding in Venice and amazing wedding dress!